If you are a site regular, then you know that we are a fan of the works of acclaimed gem artist Tom Munsteiner. The stones that come out of his Idar-Oberstein workshop are sculptural works of gem art that highlight, but do not overshadow the materials that he works in. 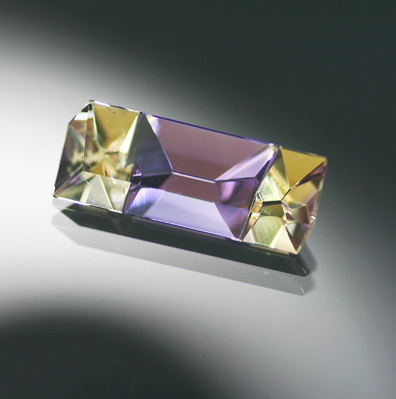 Here we have an exceptional piece of Bolivian Ametrine that, in contrast to many Munsteiner pieces, is cut to separate and contrast the two colors of the species. A remarkable piece of gem artistry - have the look at the amazing degree of undercarving in the last photo above. A great looking stone and one that comes with a full, signed certificate from Atelier Munsteiner. 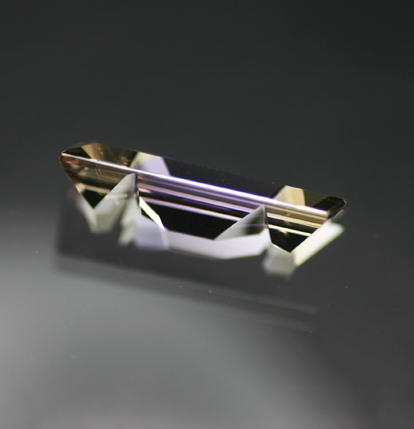 As we often say, these stones represent a great opportunity for collectors and those looking for investment pieces - unmounted Munsteiner stones are not readily available in the market and, once set, these take a significant jump in price.